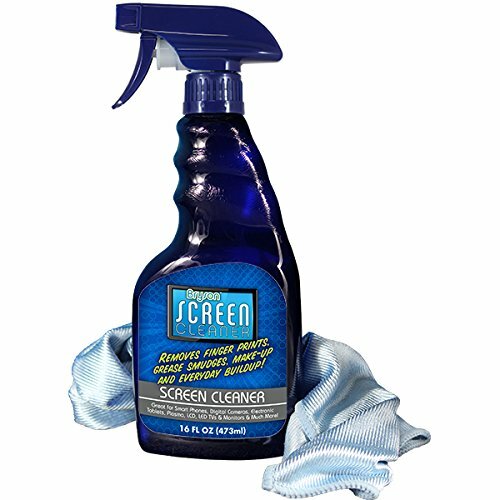 Screen Cleaner Kit for LCD, LED, Plasma Displays With Microfiber Cloth - Bryson 16 oz Spray Bottle Bryson Screen Cleaner is specially formulated to gently and effectively clean fingerprints, dust and soils on all types of screens and monitors without leaving streaks or residue on the screen. Bryson Screen Cleaner is alcohol-free, ammonia-free and phosphate-free. Why Bryson Screen Cleaner? Sometimes simply dusting your screen with a dry cloth doesn't cut it. Greasy fingerprints, dirt, and overspray from other cleaning products are commonly attracted to screens and monitors. Most screens are made of polycarbonate which is a type of plastic, not glass, which usually has an anti-reflective coating. This is the spray for removing finger prints from your laptop, tablet or I pad. Why spend so much money on the 60 inch plasma tv screen or LCD screen? This spray will keep your tv looking like you just removed it from the box! If you have any questions about this product by Bryson, contact us by completing and submitting the form below. If you are looking for a specif part number, please include it with your message.